‘We hope that the kindness of those making donations to POP UP 38 will help bring about a dramatic change in the lives of these Afghan children.’ Says locally based Naomi Harper. POP UP 38 is an exciting new charity shop on Caledonian Road selling designer and vintage clothing, shoes and art. All proceeds support Kabul’s Lapis Lazuli School (registered charity 1143632) bringing full time education to girls and boys in Afghanistan, a country with one of the worst literacy and attendance records in the world. The charity’s name comes from the dazzling blue stone which is mined exclusively in Afghanistan. Lapiz Lazuli school has just had its official opening near Kabul. The school currently caters for 300 children aged 5 to 15, with an extra classroom added each year to accommodate them as they grow older. LLS intends to provide schooling eventually right through to A-level. Alongside the Afghan Curriculum, it offers Cambridge IGCEs in Science and English and has already won prizes nationally in these subjects. The building there is not yet finished and POP UP 38 hopes to raise enough funds to heat at least 12 classrooms and to set up a science lab, as well as to complete the construction of the main school building with the addition of a second floor and a proper roof (to replace the current mud-made version). The charity depends entirely on donations and POP UP 38 will give 100% of its profits to LLS. All of its staff are volunteers. POP UP 38 will sell samples and stock from an exciting selection of designers, all of whom are donating 30% of their income to the charity. POP UP 38’s team all have a background in fashion design or fashion retailing and have edited a unique range of vintage clothing, shoes, vinyls and other artefacts for sale, including items designed by students at the nearby Central Saint Martins College of Arts and Design. 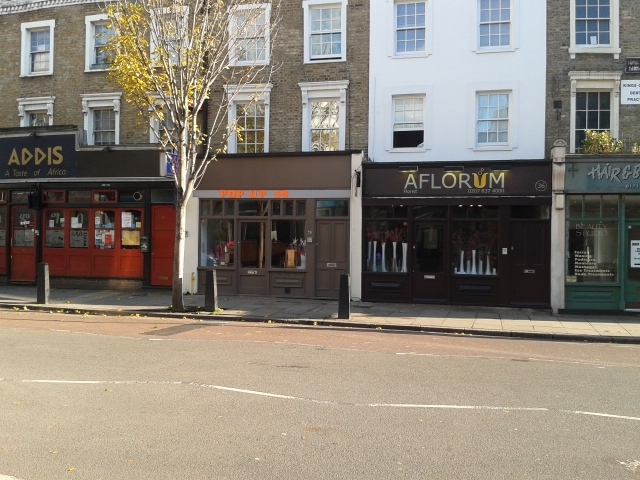 As its name suggests, POP UP 38 is at 38 Caledonian Road between Addis and Aflorum. It will remain open until February 2013. You can also make donations directly to the school here. This entry was posted in Buy&Sell, Current Affairs, King's Cross People, Local businesses, Young People and tagged Afganistan, Caledonian Road, designer, education, Kabul, Lapiz Lazuli School, Naomi Harper, Pop Up 38, pop-up, The Cally, vintage. Bookmark the permalink. Thanks so much for posting this Sophie, looks like a fantastic cause and will definitely be checking it out. Its contents were sparkling in the window when I cycled past earlier this evening. And good to see the shop being put to good use. Wichet from Aflorum said that the shop has stood empty for maybe 40 years, if I heard that right.